The goal of California County Superintendents Educational Services Association (CCSESA) is to make visible and accessible paths to 21st Century learning for California’s diverse learners through a focus on powerful arts teaching and learning that builds on and supports learning in the Common Core . Creativity at the Core is an exciting new statewide program put forth by the CCSESA. It provides professional learning modules focused on many key topics that support arts learning and Common Core Standards. Regional teams including Regional Arts Leads from across California and key Arts Organization Partners collaborated on professional learning materials that educators can use in their own educational and arts settings. Refreshing and deepening dance content through curricular best practices, sharing ideas, and sharing resources to implement Dance Content Literacy and the Common Core for Technical Subjects. California County Superintendents Educational Services Association (CCSESA) Arts Initiative launches Creativity at the Core. 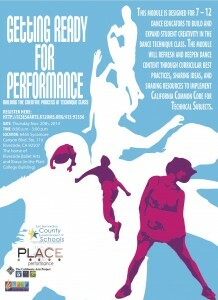 This was a professional development workshop for dance educators (grades 7-12). The workshop focused on building the creative process in technique class to improve artistic performance. 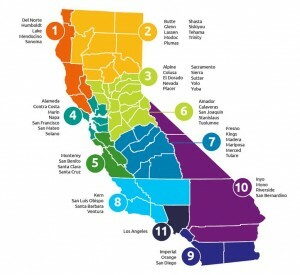 Region 10 Counties include Riverside, San Bernardino, Inyo, and Mono.